Although towel and tissue products are some of the least expensive supplies that a building service contractor deals with, because of the amount that customers go through in a given week, they can add up to be one of the greatest percentages of a customer’s cost. When it comes to choosing one’s towels and tissues, BSCs have plenty of options to offer their customers. The choices are simple enough: Paper towels are available folded or on rolls, and dispensers can have cranks, knobs or be touch-free. Toilet tissue can come standard or coreless, on single or jumbo rolls and vary in thickness. People place a lot if importance on the paper products in the restroom which is why they are such critical products to examine. Even if a restroom looks clean, when a customer is dissatisfied with the paper products used — or worse, supply has run out — people are very vocal with complaints. Which product to choose typically depends on the size and type of market being serviced. Each facility has unique needs requiring different towel and tissue products. When it comes to working on bigger properties — be it an airport, government building or large retail facility — the towel and tissue choices are even more important because of the amount of paper products these customers go through on a daily basis. Touch-free towel dispensers can reduce excess paper usage, helping high-traffic facilities use less product and save money. Kansas City, Mo.-based Burtin & Associates deals with several buildings that are in the 100,000- to 250,000-square-foot range, and has persuaded all of them to go touch-free. Many larger corporations are voicing environmental concern and are using green-certified products and touch-free dispensers. By using less supply, these facilities are promoting green initiatives, says Thomas Heveron, Beachland Cleaning Service in Vero Beach, Fla.
Health is another reason to use touch-free dispensers. With so many occupants visiting the restrooms in high-traffic facilities, there is greater potential for cross-contamination. Touch-free towel dispensers eliminate a common touch point for users, reducing the spread of bacteria. For toilet tissue in the larger spaces, jumbo rolls are preferred. “I always recommend the junior jumbo rolls. It’s cost effective and you don’t have to worry about pilferage and people walking off with regular toilet tissue,” Burtin says. Theft is usually the primary reason that clients switch to jumbo rolls. Even though Heveron has tried to persuade his customers to switch from single roll to jumbo, many refuse — and suffer the consequences. The economy is definitely influencing the paper purchasing decisions in the commercial market. One of the biggest changes over the past year has come with the toilet tissue choice of going with jumbo rolls, not because it saves the building money by its use, but because it can keep the contractor’s visits down on average two days a week. BSCs who clean commercial buildings typically choose folded towels because they are often available in softer and more absorbent varieties, they are portable to a worker’s office or cubicle, and they carry a perception of quality. However, their overuse increases labor costs because the towels must be replenished more frequently. Many commercial buildings are just starting to make the switch from folded towels to roll towels and are going with the touch-free dispensers. “The bulk of them use the plain brown roll towels. It’s cheap, somewhat green and it doesn’t cost them an arm and a leg,” Galo says. Anyone who has been involved with any aspect of a school budget understands that price is always the number one factor in decisions. Most schools still stick to the one-ply, single roll of toilet tissue, again because it’s one of the cheaper paper products available. But cheaper doesn’t mean it will save the most money, as Burtin points out, noting the difference in some of the schools he services that have made a switch. Hands-free dispensers are important in schools, especially as the kids get older. Kids have also been known to break the single tissue dispensers so they can throw the toilet paper around the restrooms, which is why Burtin tries to convince his clients to go with jumbo rolls and the larger dispensers, which are more difficult to break. 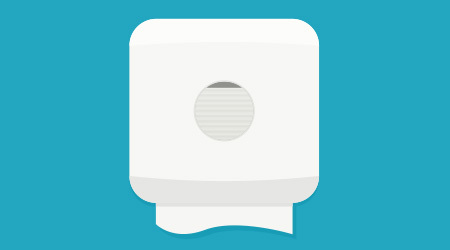 When it comes to doctors’ offices or other healthcare buildings, touch-free towel systems are almost always recommended. Similar to occupants in high-traffic facilities, healthcare tenants prefer touch-free dispensers because they minimize the spread of infection. At least 1.7 million people contract a hospital-acquired infection each year, states the U.S. Centers for Disease Control and Prevention. Using touch-free dispensers is one step to help curb cross-contamination in these facilities. Health concerns aside, custodians appreciate touch-free dispensers’ metering capabilities, which reduce how many times a dispenser must be refilled and also reduce how much waste is left in trash receptacles and on the floor. For toilet tissue, smaller healthcare facilities can use single roll toilet dispensers over the double dispensers or jumbo rolls because of price and there are less occurrences of theft, says Heveron. Regardless of facility, however, it’s important that someone is keeping track of supply. The one thing all BSCs agree on is never to run out of toilet tissue .